The student of Esoteric thought who truly desires to overcome evil must bear in mind that God made all things good, and that the perversion of good becomes evil: little errors, like tiny weeds, if left to grow unchecked, will sooner or later obscure a man’s perception of truth, and he will be unable to distinguish right from wrong. If someone’s spiritual nature is subordinate to their physical nature, they will be unable to perceive or comprehend the need of a righteous life. Those who seek true happiness must live in harmony with the laws of creation, and control their life so that every act, word and thought adds strength to their character, building instead of destroying their ability to understand spiritual truths. It is the knowledge of truth which sets man free. 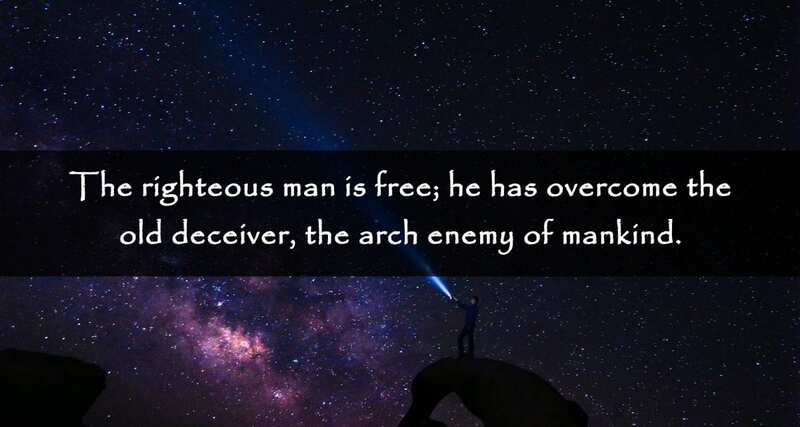 No one can be free, or even understand what freedom implies, until he becomes righteous, until he has the fear of Law in his heart, and until he loves good and abhors evil. 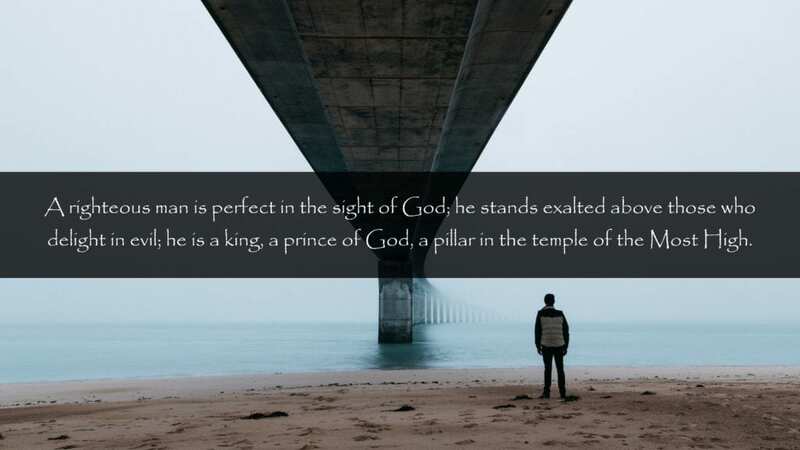 A righteous man is perfect in the sight of God; he stands exalted above those who delight in evil; he is worthy to associate with those who have passed to their inheritance; he is a king, a prince of God, a pillar in the temple of the Most High. The responsibility bestowed upon the true Esoteric student is far greater, and the consequences of broken law far graver, than is the case with a man who has not separated himself from the world, or who is still controlled by the mind whose dominion is over the creative energies of earth. The true Esoteric student, the man or woman who has dedicated his or her life to God, who has accepted Good as their strength, should be most watchful lest they offend in the slightest degree. Remember that it has been said, “Yahveh will not hold him guiltless that taketh his name in vain.” To take the name of God (Yahveh) in vain is an unpardonable sin; therefore, before you dedicate yourself to the Holy Spirit, measure well your strength. 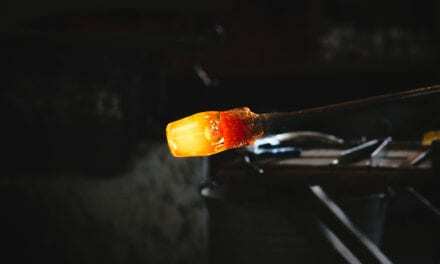 Those who have separated themselves from the things of flesh; who have entered into a close relationship with the Holy Spirit, must guard well the little acts of every-day life. They must learn to bridle their tongue and strive with all the powers of their mind and will to overcome those habits that in any way align them with the mind currents of materialism; their thoughts must renounce the old, and they must search until they find and understand the new. Those who are aligned to the mental currents of a material existence are forced onward; they are ever a victim of sickness, sorrow, and death. Those who are aligned with the currents of Infinite Life, proudly and consciously move forward; because they desire to be more closely aligned with Good. 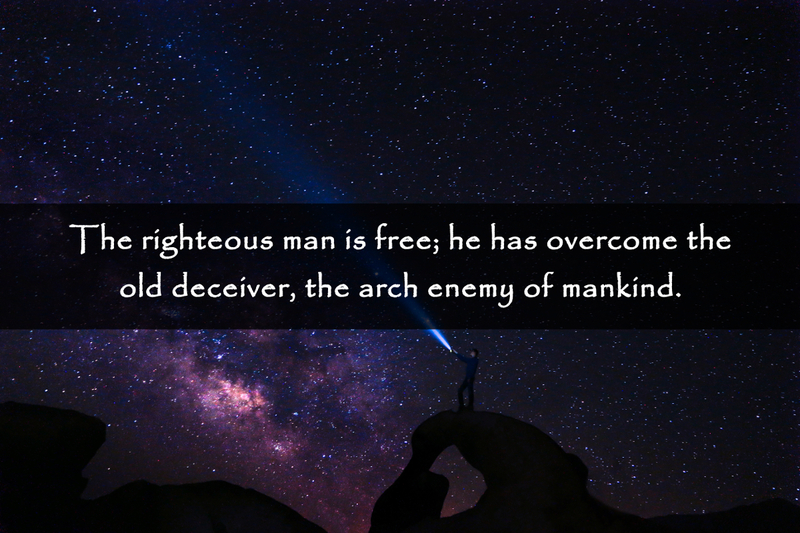 The righteous man is free; he has overcome the old deceiver, the arch enemy of mankind. He has risen above the power of the senses; they have become true servants and reliable advisers. No longer do the senses claim their master; the righteous man has found their true sphere of service. Through an understanding of their use he has been able to fend off the mortal and to stand clothed in the immortal covering of a purified and redeemed physical nature. 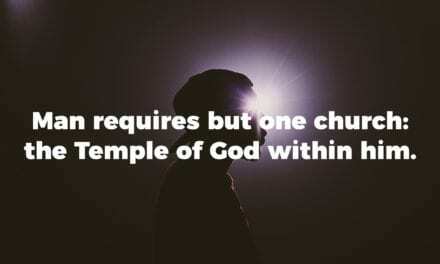 He is master of the house he inhabits, a king upon his throne, a pillar in the temple of God. How easy it is to write and think righteous thoughts – but how difficult it is to put into practice the things that we know are right. The animal man is weak; he delights in slavery; he hugs his chains and struggles against the ego that compels intelligent service. In the present day the poor neophyte finds it very difficult to walk the “Narrow Way” without stumbling. It is difficult because the prince of this world, his followers, and the mental forces of this world, oppose him. No man can travel this “Narrow Way” until he has accepted Good as his strength; until he becomes righteous; until he becomes so pure, so holy, that when the prince of this world comes he will find nothing of a worldly nature to claim as his own. How utterly hopeless the task would be, if our Father had not promised to be our strength and our protector! Dark and lonesome indeed would be the way, if the holy angels of God did not walk beside us to lighten the burden and to cheer the struggling, faltering soul to renewed effort. The presence of God’s messengers, although invisible, is a sure protection to the faithful one in the darkest and most trying hours. 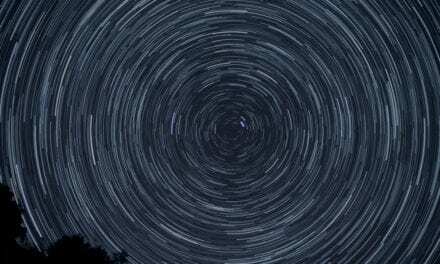 Hope, the lodestar of those who are striving to reach the high goal of spiritual attainment, shines brightly before all those who walk in faith, doubting nothing. 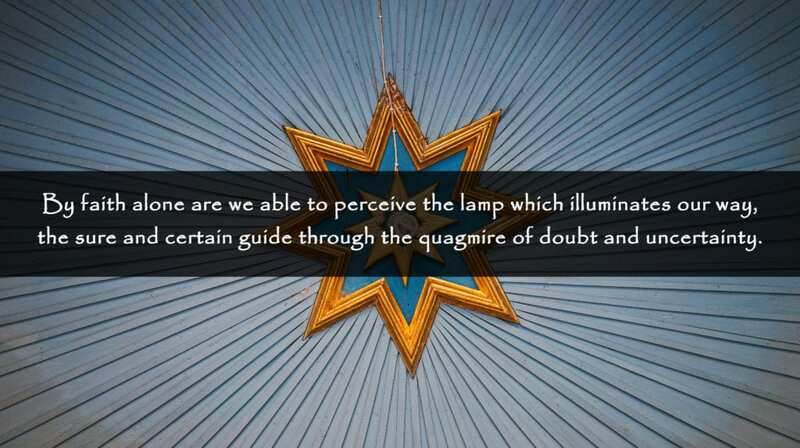 By faith alone are we able to perceive the lamp which illuminates our way, the sure and certain guide through the quagmire of doubt and uncertainty. If only all of God’s children could learn to trust in God’s saving grace, and learn to lean upon that arm which holds in place the unnumbered worlds that float in space! What a glorious thing it is to know that God’s love is ever around us; That the currents of infinite, eternal life are continually forcing themselves upon us; That his mind and will are freely offered to all who will accept and have faith in his name! God’s mind imparts to man the powers that enable him to rise above the narrow limitation of flesh; the same powers that enable us to connect with the currents of divine life, which alone can endow us with the powers of the immortals, the gift of eternal life. Man sprang from God; he is literally a son of Him, who, by the power of a word, willed our earth into existence. The son cannot gain recognition from the Father, cannot obtain the powers of a son of God, until, through living a pure and holy life, he ceases to be controlled by his animal nature, and has been transformed from the human animal into a truly righteous, spiritual man, one in whom there is no guile. In his pursuit of wealth, in his selfish struggle to obtain the good things of earth, man never pauses to inquire what the ultimate is to be, or if he does stop to question, he has no time to attend to the spiritual side of his nature. Eternal conscious oneness with God! How exhilarating the thought, how sublime the truth. Bound, as he is, by the senses, man is in darkness and chains; he is unable to perceive that light which ever shines around him. The mysteries of the kingdom have been wisely hidden from the proud and self-righteous men of the world. A child – one strong in faith – has, however, the strength to remove the veil, and to gaze upon the face of God and live. A righteous man has nothing to fear; he has overcome the world, and therefore has dominion over it.